Whether you’re loading trucks, busting up blacktop, picking pipe, digging deep, or moving materials, J-Series Backhoes are more than up to it. 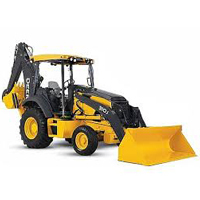 Powerful and quick high-pressure hydraulics deliver generous breakout and lift capacity at both ends, along with impressive backhoe crowd power and swing torque. Excavator-style hydraulics smoothly blend functions, so your operators won’t have to work hard to be more productive. The standard PowerShift™ transmission is also easy to operate, offering smooth, on-the-go clutchless shifting. Delivers faster acceleration, higher transport speed, and better hill-climbing capability, too. 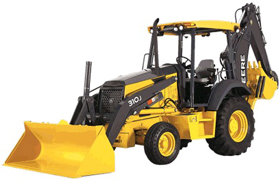 No other backhoe lineup offers a similar combination of power, speed, and ability. Standard PowerShift™ transmission allows no-clutch on-the-go shifting on all machines. It’s an industry exclusive on the 310J. With convenient handholds, self-cleaning steps, and wide entryways, getting to work has never been easier. Separate service and park brake systems provide an extra measure of security. No shortage of storage in here. There are cup holders, a place for a cell phone, and extra room for other carry-ons.